This webinar occurred on February 14, 2019. 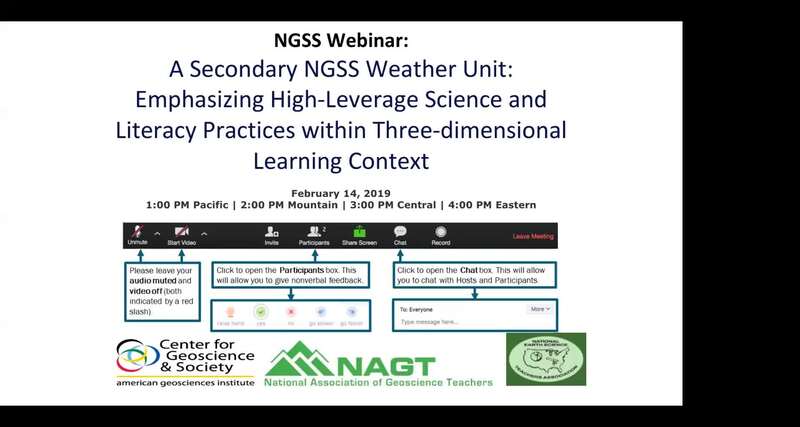 The Next Generation Science Standards (NGSS) requires all teachers to shift the way they teach science, emphasizing three-dimensional learning as well as strong literacy integration as part of instruction and assessment. Many secondary science teachers have few curriculum resources to help them meet the demands of these new shifts in teaching. To support them, science and education faculty from a three-year federally-funded professional development project developed seven earth science units for middle school teachers. These teachers completed all of these units with their "student hats," and then they adapted and implemented them with their middle school students. One of these units was about weather that aligns with the NGSS Disciplinary Core Idea MS ESS2.D, Weather and Climate. This unit, titled "When Air Masses Collide," addressed how air masses are complex weather phenomena and how understanding the dynamics of them can help us predict the weather. During the webinar, most core instructional and assessment activities from the unit will be shared. This includes activities such as the real-world anchoring phenomenon, which students watch a time-lapsed video of the passage of an intense cold front and students develop a conceptual model of it, the supporting inquiry-based activities for students to acquire the knowledge and understandings to explain this phenomenon, and then final activity when students write a final gapless explanation of the passing front and change in air masses. An emphasis will be given to the high-leverage science practices such as modeling, argumentation, and science explanation, including the pedagogical strategies that accompany these practices. In addition, we will highlight the literacy practices to support all learners that were seamlessly integrated as part of instructional and assessment practices throughout the unit.